A new breed of companies is changing the way the world does business. BOISE, Idaho, Aug. 17 /CSRwire/ - Airport readers will soon be turning the pages of a new book charting a socially responsible revolution in business as Hudson Booksellers has selected Rise Up—How to Build a Socially Conscious Business for a nationwide promotion. 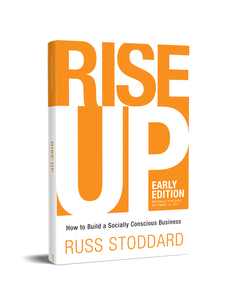 For the month of October, Rise Up—How to Build a Socially Conscious Business by Russ Stoddard will be a featured book on the business table in 80 Hudson Bookseller stores at airports across the country. “This confirms there is significant interest in a new breed of businesses called social enterprises that create social impact, positive environmental outcomes, and financial profit as well,” said Stoddard. Rise Up—How to Build a Socially Conscious Business is currently available for pre-order on Amazon and will be released nationwide on September 19, 2017. Rise Up, published by Elevate Publishing, serves as a guide for entrepreneurs who want to align their values with their careers by creating social enterprises that solve social and environmental problems. In the book, Stoddard shares insights and guidance for building a socially conscious business based on more than 25 years of experience starting and running social enterprises. Acclaim for the book has come from all sectors in the business world. “Whether you are an aspiring entrepreneur, an employee, or a consumer (yup – basically anyone), this book is for you,” said Kate Williams, CEO of 1% for the Planet. Russ Stoddard is regarded as a leader in the movement for socially conscious business. He is the owner and founder of Oliver Russell, a certified B corporation and legal public benefit corporation in Boise, Idaho. Oliver Russell builds brands for purpose-driven companies with a product, service, or business model that benefits society. More information about the author and the book can be found on his website.